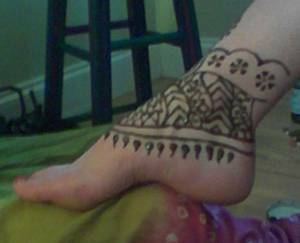 I was very happy to be invited to do henna tattoo for guests at an intimate bridal shower this weekend. The decorations were fabulous! The mood was so lovely.. and as there were only a few guests present, everyone was able to choose an intricate henna design if they wanted one. Of course, some simple designs are just as lovely as the more intricate ones. 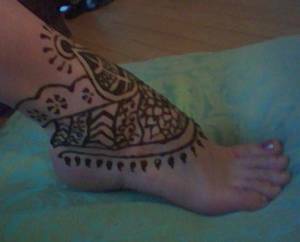 However, I was very happy to be able to do this bold henna tattoo in an anklet cuff style. What I invite you to notice is that the bold style of this design is a perfect completment to the clients ankle. She was delighted... and I was happy to offer this modified traditional design. For events where it is reasonable to expect that most people will not choose to have henna applied to the hands I often make the paste more liquid.. giving it the greatest opportunity to stain the skin. I was also very happy to have my beautiful assistant on hand to apply lemon sugar to all the designs as they were drying. This additional service really seemed to help the guests feel more pampered! If you live in North East Florida an would like to hostess a henna party, please feel welcome to contact the Studio at (904) 993-7466.